Like most malls, our local Westfield version has several major anchor stores and a multitude of smaller shops. Kiosks camp in the corridors on each of the mall’s two levels. In these kiosks, you can have your teeth whitened, buy a blingy cell phone case, get a Wetzel’s Pretzel, have your picture taken by a professional photographer, purchase a miracle cosmetic. Sound familiar? Each Monday morning for the past 10 weeks with two to go, I’ve taken the escalator by the food court down to the lower floor of the mall. The escalator lets its riders off next to Victoria’s Secret. A long hallway runs beside Victoria’s Secret and ends in double doors. Go through those doors and you’re in classrooms used by our local community college, College of the Desert. There’s a receptionist, three office cubicles, four classrooms. Who knew? I didn’t until I took a class called Writing the Personal Essay, coordinated by PEN Center USA – through their PEN in the Community Residency Program, and the Palm Springs Writers Guild. The class is taught by Journalist/Freelance Writer/UC Riverside instructor Maggie Downs. 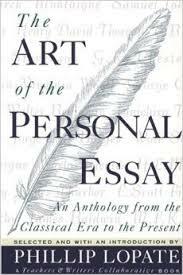 For clarification, a personal essay is a short work about a personal experience. A memoir is book length about many experiences. How did you feel during the experience? What was your body doing? What was your inner dialogue? How did the experience help you reflect on your own life? What revelations did you discover about yourself? What discoveries did you make about the human condition? What universals about mankind did you find? Found this book in my bookcase. In the PEN class we study essays culled from current online or print publications such as The New Yorker, Orion Magazine,The Sun Magazine,The Believer, The Toast, The Butter. I’m used to fiction writing and creating characters in stories. I’m used to theatre and creating characters on stage as an actor or director. I’m not used to writing and sharing an inner reflection in a public forum. Guest speaker for one class was author Tod Goldberg who, when asked about this process of revealing, said a writer should only reveal what he’s willing to let go of because once it’s out there, it’s out there. Makes sense. We’ve been writing essays and workshopping each other’s work. We’ve been learning techniques to access our inner dialogue and dissecting essays by prominent essay writers. I’ve compiled a thick notebook of these essays AKA our textbook. Here are just a few of the essays we’ve read. “Now We are Five” by David Sedaris, “Botswana” by Todd Pitock, “The Fourth State of Matter” by Jo Ann Beard, “The Way Woman Laugh” by Dani Shapiro, and “Thanksgiving in Mongolia” by Ariel Levy. Some are edgier than others. And after the two hour class, a few of us have lunch in the food court and then go on our ways. As I passed a kiosk on the second floor near the food court, a not unattractive young man waved a colorful plastic bag at me. I shook my head no. He waved it again, took a step toward me, an engaging smile on his face. I took the bag. Then he motioned me closer. He had something wonderful for my complexion. Oh, what the hell, I thought. Soon he was smoothing something on the wrinkles near my left eye. Next he waved a fan to help the concoction dry. Then he held a mirror in front of me so I could see the miraculous change, the before of the right eye area, and the after of the left. Sure enough, the wrinkles near my left eye were gone. Miracle or not, I knew I had to escape before the real sales pitch began. I backed away, smiling , and thanked him. I was also thinking “allergy girl” here probably didn’t use the best judgment in allowing magic potions on the face, especially so near the eye. I was pretty sure a skin reaction was in my near future. I continued on to See’s Candies for a sample and looked at the jewelry in several windows of the mall’s gazillion jewelry stores. Slowly I realized there was no itching, no watery eye, no irritation, no reaction. I put my hand on the area with the magic on it. Wow! No wonder the wrinkles were gone. The stuff had worked like a lightweight Spackling compound used to fill cracks in walls before you paint. Smooth and rigid. Was it going to crack off? It ultimately disappeared, absorbed into my skin, leaving the wrinkly lines very much back in place. So much for instant fixes. I have this scarf I carry that is kind of like a two year old’s blankie. It goes everywhere with me. The scarf is black, gray, and white and rather long so it can be looped and draped around my neck or shoulders. Weather can be weird in the desert, and air conditioners are often set at levels to preserve meat. I had the scarf draped on top of the big purse I carry. At some point, I realized I’d lost the scarf. Damn it. So I retraced my steps. Past the escalator that lets you off by Victoria’s Secret, past the kiosk with the Spackling compound, down the promenade toward See’s. Then I saw the scarf. It was draped over the railing where people stand and look down on the floor below. Some good Samaritan found it, draped it, and hoped for the best. Whoever you are, thank you. This entry was posted in Authors, Creativity, Finding Ideas: The Creative Process, Inspiration, Looking for Inspiration, Reading, Writing and tagged Ariel Levy, Dani Shapiro, David Sedaris, experience, feelings, human condition, inner dialogue, introspection, Jo Ann Beard, PEN, PEN Center U.S.A., personal essay, personal story, reflection, revelation, The New Yorker, Tod Goldberg, Todd Pitock, universals of mankind. Bookmark the permalink. I love it. I love your blog. How enlightening. Hi, Ruth. Thanks for stopping by and “following.” Enjoy workshopping with you! Great class. As someone who is writing a memoir, I found this very informative. I see my memoir as a series of personal essays linked together with a common thread. It’s an extension of the String Quartet idea. As someone who has been cajoled by the handsome young people to just try the miracle product, I was entertained by your story! I love the String Quartet idea and look forward to reading your memoir. Glad you found something of value in the post. Beware of the kiosks! Thanks for stopping by.